Nice hotel in a convenient neighborhood, very close to the underground. I was in a single room with a big bathroom, comfortable and clean. I think it's good value for money. 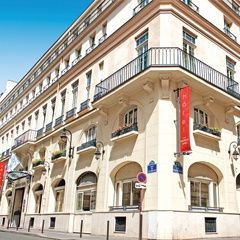 I would consider to go back in this hotel in my next visit to Paris. This web-user gave a score of 1 / 5 to Vacances Bleues on february 2019, but declined to leave a comment. Generally OK, very good location. First room we entered was with leaking ceiling and very bad smell. they changed our room and sent us to another room. was better than the first. Breakfast was good, but be careful when staff says "room XY have a nice stay and breakfast is included in the hotel" . They mean that it is served in the hotel not covered by the hotel. thanks for all the staff, they were helpful, always.